The 85th annual Acfas Congress may be five months away, but McGill is already busy tackling the logistics of hosting the world’s largest French-language interdisciplinary conference. 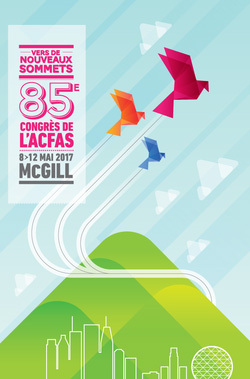 The 85th Congrès annuel de l’Association francophone pour le savoir (Acfas) may be five months away, but McGill is already busy getting ready to host what is the largest French-language interdisciplinary conference in the world. The 2017 Acfas congress will run from May 8 to 12. The theme is “Vers de nouveaux sommets,” and the event will highlight cutting-edge research in all disciplines while also celebrating a rich legacy of past discoveries. With an estimated 6,000 delegates from some 40 countries expected to flock to McGill’s downtown campus, event planning is already well underway. In addition to the colloquia, the Acfas congress will feature a week of free, research-focused events that will be open to the public. Pascal Brissette, president of the Comité des activités grand public, and committee member Stéphan Gervais (both from McGill’s CRIEM) are currently putting the finishing touches on event proposals. The McGill Reporter will publish a full schedule of Acfas events when details are finalized.